Humans are social beings. But what are they when isolated and lonely? In It Seems To Be Loneliness But It Is Not Lukas Marxt puts himself in this situation by going to a place where human encounters and exchange can hardly be expected. The artist moves through an inhospitable location. The subjective camera makes his gaze our own as he glides over a variety of structures in the rocky ground of the volcanic Canary Island of Lanzarote. 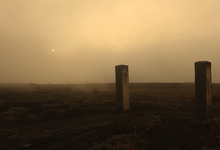 The film´s first shot takes us over rugged terrain, and we can sense the nearby abyss. The crunching of the gravel and the artist´s labored breathing accompany each step of this expedition, giving us a feel for the efforts and difficulties involved in his progress. A restless searching in circles throws us back to our own expectations, which contrast with the ease of a sauntering man. In the distance we see a building with antennas and broadcasting towers jutting into the sky, indicating a form of communication from which we remain excluded.